The modernization of power grid industrial control systems is likely to lead to the adoption of modern cloud services for data historians and to derivation of “big data” analytics. The data destined for that cloud service consist of either PMU measurements cached in several data-concentrators and part of the new wide-area measurement systems, or power injection and flow measurements accrued by SCADA servers. Those data today are processed separately, because current power system state estimation (PSSE) lacks support for heterogeneous sampling and sensing modalities. 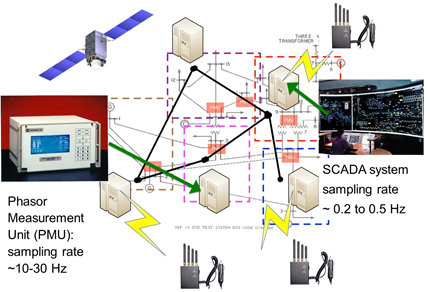 An implicit assumption made in previous studies on PSSE is that the time and frequency at which PMU/SCADA measurements are taken are consistent across all the distributed sensing sites. In reality, the times of measurement often lack consistency and integrity, which is an intrinsic vulnerability of wide-area sensor systems. Data logs coming from different analog to digital converters are not in phase and may also differ in the frequency of sampling. In recent work, we advanced the area of decentralized signal processing and explicitly considered timing errors and non-homogenous sampling rates in linear and nonlinear least squares estimation problems with distributed sensing. For linear observation models, we provided a necessary and sufficient condition for identifiability of the sampling offsets. In this project, we studied the formulation of the PSSE problem with asynchronous sampling, and studied how signal processing techniques can be applied to prevent and correct timing attacks, such as GPS spoofing. We proposed a general algorithm for joint regression on latent vectors and on sampling offsets; in it, we exploit asynchrony and redundancy in the spatial sampling to attain sub-Nyquist sampling resolution of the slow sensor feeds. The efficacy of the proposed decentralized algorithm was shown by numerical simulations, which demonstrated that the power system state can be recovered even if it was sampled by the slower, sub-Nyquist SCADA sensors. We also studied the conditions required for successful detection of timing attacks under the PMU-only model. Roughly speaking, the condition states that we will need to deploy more sensors than are needed in the absence of a timing attack.